When using a coordinated compound document, any report component that exceeds the designated vertical coordinates within the page layout automatically generates an overflow page at run time. You may customize the layout of the subsequent pages by adding a new overflow layout page for the selected page layout. This enables you to add different headers and footers between the first page of the report and the overflow pages of the report. In general, each report appears once for each page layout and continues until the data is complete. The new overflow page option enables you to specify reports or graphs that should repeat on each subsequent page to create different headers or footers. For example, the outline below details how adding a new overflow page may be useful in creating headers and footers for overflow data. Create a page layout with a report component that creates overflow. For example, a report component on a single page layout generates seven pages of output. The first page of the report output inherits any styling that is applied on the Page Master, if applicable. The second page of the report output is the beginning of the overflow results for the first coordinated sort value. In Design View, you may add a new overflow page to the page layout. This enables you to add reports and graphs (as header and footer information) around the overflowing object. Tip: A report component added to the overflow page, as a header, may contain data such as variable data inserted through a report. The report and graph components added to the overflow page appear as headers and footers for the overflow pages of the report output. 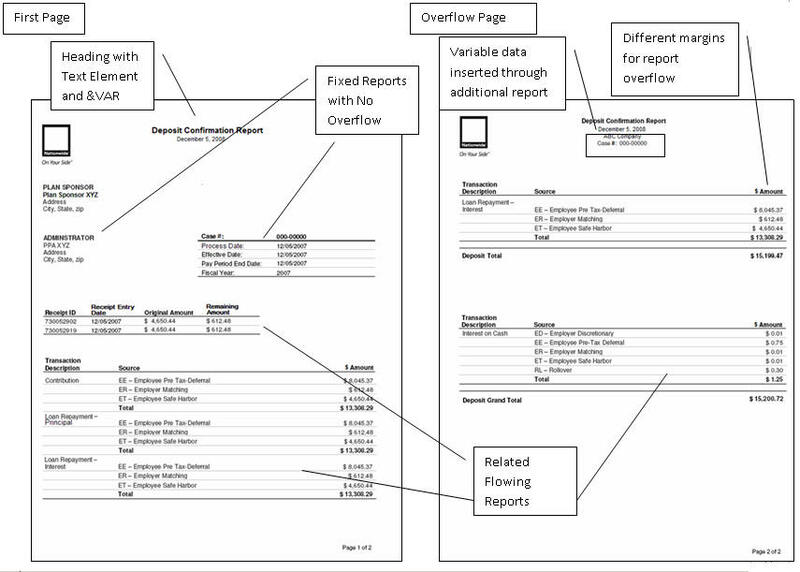 In this scenario, page two of the document will display the report component added to the overflow page. The following image is an example of a coordinated compound report with a customized overflow page. The header on the first page contains an image and a text box with an embedded variable. An additional report has been added to the header for the overflow page only. This section describes How to Add a New Overflow Page to a Page Layout, How to Add Header and Footer Information to the Overflow Page, and Usage Notes for Adding Components to an Overflow Page. Each page layout works independent of any other page layout in the coordinated compound document. This enables you to add a new header and footer for each individual page layout and associated overflow pages. The following procedure describes how to add a new overflow page from the page layout. From a fixed report component in a coordinated compound document. Select the report component in the page layout, right-click, and select Customize Fixed Overflow from the context menu. The overflow page, displaying a copy of the fixed component (with the original size and position) from the page layout, is added after the page layout in Design View. This enables you to move and resize the overflow object, and add reports and graphs (as header and footer information) around the overflowing object. On a page layout with a fixed or flowing report. Select Add New Overflow Page from the New Page Layout drop-down list. The overflow page is added after the page layout in the Design View. You may add reports and graphs to the overflow page. Note: If there is a flowing report component, any flow margins defined on the page layout will also appear on the overflow page. This enables you to move and resize the flow margins, and add reports and graphs (as header and footer information) around the flow margins. The overflow page is identified as Page layout n, overflow object, where n is the number of the corresponding page layout. The overflow page can also be accessed from the drop-down list of objects in the Properties window. You may add report and graph components on the overflow page as header and footer information for the overflow data, and position and size the components as desired. You may copy existing components from the page layout, or add new report and graph components. All components added to the overflow page are automatically assigned as fixed components on the overflow page. Note: The report and graph components added as headers and footers should not generate additional overflow. Select the component from the original page layout, right-click, and select Copy. Select Page layout n, overflow object from the Properties window drop-down list, or scroll down in the Design View until you see the overflow page. The overflow page appears in the layout. The component is copied to the overflow page, maintaining the size and position from the page layout. Note: If the component was flowing on the original page layout, it is then automatically changed to a fixed object on the overflow page. Select Page layout n, overflow object from the Properties window drop-down list. Right-click and select New Report or New Graph from the context menu. Note: You may also add these components through the Insert menu, or the Components toolbar, of Document Composer. Click and drag the crosshair to create a report object, or graph object, and adjust it to the size you want. Open, import, or reference report or graph information as usual. This behavior is identical to adding a report or graph on the page layout. Note: Keep in mind that these objects are acting as header and footer information, so they should not generate additional overflow. To edit the report or graph component on the overflow page, double-click the object to open the associated tool and apply any styling or data changes. 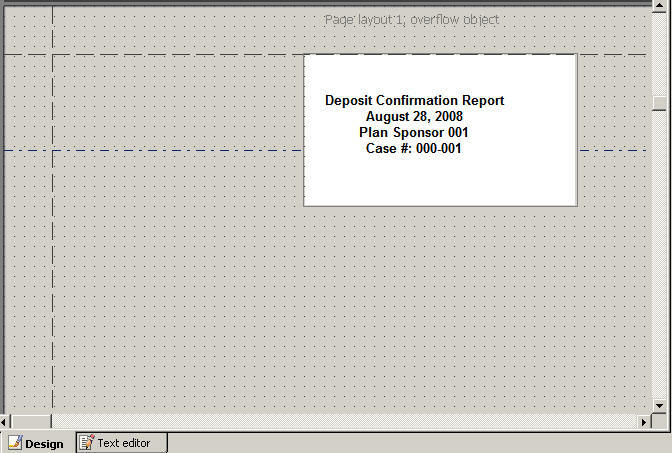 The following image is an example of an overflow page with a report component added as header information. The report contains a variable added to the page heading of the report with styling applied to the text (within the report) in the page heading. 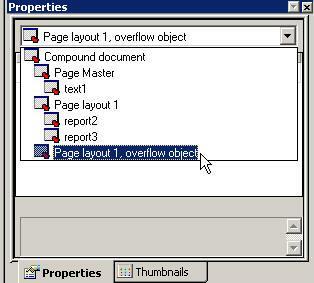 Ensure that report components added to the overflow page do not generate overflow. The Overflow and Styling options are not available on the overflow page and are automatically set to be fixed objects. The space provided for the report component must be sufficient to present all of the data generated within the report, so that subsequent overflow is not generated. Additional images, lines, and text can be added to the overflow page by inserting them into report components. By default, copying a component from the page layout to the overflow page retains the position attributes, so you can easily ensure the positioning is the same on the page between the first and overflow pages.